"Why would anyone want to give their child an expensive pill … with unacceptable side effects, when he or she could just go into the backyard, pick a few leaves off a plant and make tea for him or her instead?" Jensen asked the Drug Policy Subcommittee of the House Government Reform Committee earlier this month. 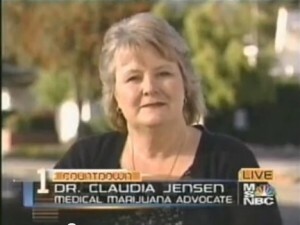 While some wonder whether Jensen was smoking some wacky weed herself, the clinician for low-income patients and professor to first-year medical students at the University of Southern California (search) said her beliefs are very grounded: The drug helps ease the symptomatic mood swings, lack of focus, anxiety and irritability in people suffering from neuropsychiatric disorders like ADD and attention deficit/hyperactivity disorder (search). "Cannabinoids are a very viable alternative to treating adolescents with ADD and ADHD," she told Foxnews.com. "I have a lot of adult patients who swear by it." "I do believe that Dr. Jensen really wants to help her patients, but I think she is deeply misguided when she recommends marijuana to teenagers with attention deficit disorder or hyperactivity," he told Foxnews.com. "There is no serious scientific basis for using marijuana to treat those conditions, and Dr. Jensen didn’t even try to present one." Dr. Tom O'Connell, a retired chest surgeon who now works with patients at a Bay Area clinic for patients seeking medical marijuana recommendations, is working on it. He said cannabis not only helps pain, but also can treat psychological disorders. He is currently conducting a study of hundreds of his patients, whom he said he believes have been self-medicating with pot and other drugs for years, and he hopes to publish a paper on the subject soon. "My work with cannabis patients is certainly not definitive at this point, but it strongly suggests that the precepts upon which cannabis prohibition have been based are completely spurious," O'Connell said. Worse yet, he added, the prohibition has successfully kept certain adolescents away from pot who now turn to tobacco and alcohol instead. Jensen, who said she believes Souder invited her to testify to "humiliate me and incriminate me in some way," suggested that a growing body of evidence is being developed to back medical marijuana chiefly for chronic pain and nausea. She said it is difficult, however, for advocates like herself to get the funding and permission to conduct government-recognized tests on ADD/ADHD patients. "Unfortunately, no pharmaceutical companies are motivated to spend the money on research, and the United States government has a monopoly on the available marijuana and research permits," she told Congress. Studies done on behalf of the government, including the 1999 Institute of Medicine’s (search) "Marijuana and Medicine: Assessing the Science Base," found that marijuana delivers effective THC and other cannabinoids that serve as pain relief and nausea-control agents. But these same studies warn against the dangers of smoking marijuana and suggest other FDA-approved drugs are preferable. "We know all too well the dangerous health risks that accompany (smoking)," said Rep. Elijah Cummings, D-Md., ranking member on the subcommittee, who like Souder, was not impressed by Jensen’s arguments. "It flies in the face of responsible medicine to advocate a drug that had been known to have over 300 carcinogens and has proven to be as damaging to the lungs as cigarette smoking," added Jennifer Devallance, spokeswoman for the White House Office of Drug Control Policy (search). "Ritalin is an amphetamine — we have all of these youngsters running around on speed," said Keith Stroup, spokesman for the National Organization for the Reform of Marijuana Laws (search). "Although it flies in the face of conventional wisdom, it's nevertheless true that cannabis is far safer and more effective than the prescription agents currently advocated for treatment of ADD-ADHD," O'Connell said. "It was a good day for her, and a good day for medical marijuana in Congress," he said. Nick Coleman, a subcommittee spokesman, said Souder doesn't "try to humiliate people. "But to promote medical marijuana for teenagers with ADD … he does not feel that is a sound and scientific medical practice," Coleman said. "(Rep. Paul) believes there are some legitimate applications," like for pain and nausea, said spokesman Jeff Deist. "But the real issue is that states should decide for themselves." Related Post Medical marijuana for ADD and it’s good for kids!